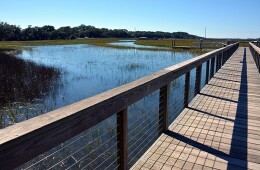 Coastal Discovery Museum (CDM), a natural science and history museum, is situated on Hilton Head Island on the Honey Horn Plantation’s 68 historic acres that include salt marshes, centuries-old oak trees and 11 buildings. The site is owned by the Town of Hilton Head and leased to CDM for 95 years. Opportunity Resources Inc. had 12 years ago placed the now‑retiring President & CEO. He was legendary in the community, having helped negotiate with the Town in 2007 for this beautiful and ecologically important site. He had drawn on the potential of the unique and environmentally rich acreage and made it into one of the Island’s most important venues. CDM’s trustees again retained ORI to help them confront the question: what was the next stage for its already impressive achievements and who was going to lead it. The new President would be managing a relatively small staff and budget, which had, even with limited resources, gotten remarkable results, serving 100,000 visitors a year. S/he would have to be deliberate, but also forward-thinking. S/he would like challenges, be creative, energetic and accessible, and would embrace and be embraced by the Island’s unique population. A background in natural history and a commitment to ecology and the sustainability of the environment were important as was an advanced degree in a related academic field. For this search, in addition to a broadcast letter widely announcing the position and the use of our extensive database, ORI focused on direct recruitment among a select group of senior staff in several disciplines, especially those in environmental and ecology centers, science and natural history museums and nature conservancies. The Search Committee liked all the candidates they interviewed and felt they could work with any one of them. But one stood out because in addition to his experience, his was the best personal fit with the Board and the community. The successful candidate was Dr. Rex Garniewicz, who had been Chief Operating Officer, then promoted to Deputy Director at the Museum of Man in San Diego, a museum he described as in the process of reinventing itself when he was hired there. Rex had supervised almost every department within the Museum and played an important role in the Museum’s transformation. His academic background, including a Ph.D., was in anthropology and archaeology. Rex began at Coastal Discovery Museum in July 2014.